Both Teaching Grammar and Mechanics and Teaching Essay Strategies make sense out of integrating grammatical instruction and writing. Easy to teach, too. My kids have definitely improved their writing and test scores as a result of using these curricula. Daily Language Review is meant to supplement grammar and mechanics lessons that are in textbooks. The textbook lessons include teacher guidance, lessons that lay foundations for students, and activities that provide application opportunities. DLR or DOL is meant to provide purposeful practice and get students thinking about what they’ve already learned. Absolutely true; however, most upper elementary, middle, and high school teachers use DOL as their only means of grammar and mechanics instruction. Additionally, DOL is divorced from the context of authentic writing and has no meaningful instructional scope and sequence. Everyone assumes that someone else has taught a given subject, and only review is needed. Diagnostic assessments, such as the one on my http://www.penningtonpublishing.com site would prove otherwise. I think teachers can do better. I disagree with this assessment. I’ve used D.O.Ls extensively in my classes and found success with them. Requires no teacher prep? Really? I expect that may be true for those teachers that just put these sentences up there, go over the corrections, and call it a day. However, I review each concept and model the ones students have most trouble with. I understand that the current educational climate is peppered with the idea that we have to make every lesson into a game, but practice and repetition are not “evil,” nor should they be excluded from the classroom. Yes, it is editing, but the booklet isn’t the teacher…it’s a tool. As such, it can be adapted…SHOULD be adapted. Anyone who relies solely on a text to provide all the questions, all the activities, all the answers, all the modifications…that person is not doing their job. They’re merely an automaton. I totally disagree with this commentary. I have used D.O.L.s in my classroom for many year, and contrary to what the author wrote, I do NOT use it as busy work! I teach grammar, writing, and mechanics as well, but I supplement the teaching with the D.O.L.s. It helps to teach my students editing skills, as well as how to recognize what is wrong and how to correct it, and it also allows me the opportunity to review the vocabulary and spelling words I’m teaching that week. I alternate between these and journal writing, and my students leave with a clear understanding of how grammar works and how to incorporate those into their writing components. Hello? Did you miss the ORAL in D-O-L? The correct way to use the technique is for the teacher to be actively involved and DISCUSS the errors. Does it involve higher level thinking skills? You bet it does if the teacher knows how to use them. For example: What are the grammar errors? What are the spelling errors? What are the punctuation errors? What are the capitalization errors? What type of error is this? Why is this wrong? Is there another way to correct it? The teacher makes the corrections as students contribute the right answers. An equally effective method is to let a student come to the board and make the corrections and then discuss them with the whole class. When used as an ORAL activity (as intended)student participation is enthusiastic and the activity is fun. As a result, students experience success and achievement is raised—significantly. As a current high school educator, and a recipient of the 1980s Daily Oral Language Curriculum, I have to stay I totally disagree with your argument presented here. You sir may be a M.A Reading Specialist, but as an M.A in Education with experience in an urban classroom, I can tell you children need to learn editing skills. Learning how to edit and correct sentence structure, spelling, and grammar are the very basis of becoming a fully literate adult. I benefited greatly, as did my peers, by the emphasis of my school on identifying and correcting writing errors. I have always been keen on checking my writing for errors ever since my elementary school teachers placed such a high regard for being aware of proper English mechanics and grammar. I doubt that I have achieved such academic success without Daily Oral Language from 1st grade throughout elementary school. In addition, I’d like to support the above commentator. My experience as a child was with teachers who lead a whole class discussion in order to correct the sentence on the board. There were always plenty of volunteers to go up and fix an error on the board and explain to the class why. The “Oral” part of “DOL” is very constructivist, student centered, and effective. Children must learn to edit and correct grammar and mechanics. I certainly agree with you that we need to teach grammar, mechanics, and spelling. My take is that D.O.L. and D.L.R. are not the best instructional methodologies. The proof is in the pudding. After years of such instruction in elementary, middle school, and high school, one would think that remedial writing courses in our community colleges and universities would be non-existent. Not so. Now to be fair, the other popular means of language instruction, Writers Workshop mini lessons taught in the context of the Writing Process, has produced similar results. My point is that perhaps it’s time for a language curriculum that emphasizes both direct and differentiated instruction, aligned to the Common Core State Standards Language Strand. Students simply need more in-depth instruction and practice in the writing context to ensure mastery and transfer than the above approaches offer. Additionally, rather than “reviewing” the same grammar, mechanics, and spelling skills year after year (whether students know them or not), it makes sense to differentiate instruction according to diagnostic assessments. According to teacher reviews and testimonials, my Teaching Grammar and Mechanics curriculum seems to accomplish these ends. I have to disagree with your assessment of Daily Oral Language. It gives short, to the point practice in editing. I found that when my classes were working compositions, we had a common frame of reference for why a correction needed to be made, and the kids knew what I was talking about. We could speak the “language” grammar and punctuation. I agree that DOL is excellent editing practice; however, grammar-usage-mechanics are not just about fixing things. They are about writing, and DOL does a miserable job transferring to student writing. My child is learning DOL now and it is confusing and she has one of the best teachers in her school. I suspect this was supposed to be used as a supplemental curriculum and public school funding was cut and the classrooms grew too big for anyone to handle. Now we have SOLs and teachers unions are disappearing and so are critical thinkers from our entire culture. America needs to slow down, let our children process and think. Just another example of the “stupification” of this country. Welcome to the world of education. My point is pointed, as my concern is students. You’re absolutely right about everything you have written; I couldn’t agree more. I have done my own research in the classroom, and your comment “DOL does a miserable job transferring to student writing” is dead-on accurate. This is so true….don’t throw the baby out with the bath water. If this program is used by thinking caring teachers, it canbe very successful! I am on here because my step son who has autism is struggling with DOL and has been. He attends a public school, in a regular classroom and for the past 7 years, I have done everything from almost standing on top of my head to making fun time out of studying to help him maintain his GPA which right now is a 3.5 but falling because of DOL. Just looking for new ways to try to make this “work” for him. Any advice will be greatly appreciated. Hi! English is my second language and I am currently a Professional Writing Tutor at my college. I can tell you that DOLs helped me a great deal in understanding the functions of grammar. It helped me see where a comma should go and when I didn’t need one. It was a great tool in getting me where I am today. No device, or system is perfect, it works for some and doesn’t work for others. Do not dismiss it completely. Every technique serves a purpose. DOL is meant to supplement a lesson. My problem is not with DOL, but with Common Core that excludes grammar. In the state of NC where I teach, ELA teachers are supposed to use the Reading/Writing workshop style for teaching. When this is used exclusively, as is asked for us to do, there is really no “teaching” going on. When a teacher tries to do grammar lessons, they are told that they are not doing the reading/writing workshop method correctly. It is hard to do what you are told when you know in your heart that it is not what is best for kids. I’m afraid you are mistaken. The Common Core State Standards have been roundly criticized because of their intense focus on grammar. 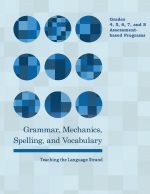 In fact, a separate Strand is dedicated to grammar, mechanics, vocabulary, spelling, and language application: The Language Strand. I’m quite familiar with this Strand, having just launched a series of curricula to address these specific Standards. Unlike “supplemental” D.O.L., my Standards-based programs are sequential, comprehensive, and effective. If teachers teach these Standards with fidelity, students will certainly learn their grammar and usage. Following are brief program descriptions. I’ve been doing DOL with my 4th graders for several years. Students use worksheets and I have a class copy on the computer, which is projected onto a screen. Students identify errors and make corrections on worksheets and the computer, then rewrite the sentences. Kids take turns retyping as well. That way I’m teaching word processing skills as well. I alternate teaching grammar units with writing units, but do DOL every day along with them. I thought I had the right approach until I read the “walk and chew gum” comment above. Maybe I’m trying to accomplish too much. I’ve been considering dropping the DOL. Opinions? Yes. DOL certainly does not match the Common Core Language Standards. No sequential instruction, no connection to writing, no connection to reading… Teachers know what works and what does not. As the author of this article, I’ve struggled to find grammar, mechanics, spelling, and vocabulary resources that make sense and are authentically connected to the writing and reading context. It’s easy to criticize a flawed program such as DOL, but harder to put forth a constructive alternative. This next month I launch Teaching the Language Strand: a comprehensive Grades 5-8 program, perfectly aligned to the Common Core Language Standards. Having field tested these programs for the last two years, I’m excited to share these materials with teachers who truly want to improve their students’ language skills. Each full-year program provides interactive grammar, usage, mechanics, and spelling lessons, a complete spelling patterns program, language application openers, and vocabulary instruction. Each program has all the resources to meet the needs of diverse learners. Diagnostic assessments provide the data to enable teachers to individualize instruction with targeted worksheets, each with a formative assessment. Progress monitoring matrices allow teachers to track student progress. Each instructional resource is carefully designed to minimize teacher preparation, correction, and paperwork. A student workbook accompanies each grade-level program. I invite you to check out the Teaching the Language Strand program. I am a case study for DOL not working, I went through Portland Public Schools in the 90’s where it was used extensively. The kids used to refer to it as “dull” my teacher would put a sentence on the board and call on individual students to make a correction. It was easy to cherry pick an easy capitalization error etc. and avoid trying to figure the more complicated concepts. I’m a smart guy, high sat scores and all that but have remedial punctuation skills at best. I had multiple professors in college remark that I was one of their most talented student who had no clue on how to use a semi colon. I survived college with extensive editing help from the writing lab on my campus. Funny how most teachers disagree (is it about how easy this is for them or the long term benefits of the student??) As a parent, I completely agree with everything in this article. As a transactional attorney all I do is read, write, and edit documents. I’m shocked by the poor writing and grammar by most people-even the educated. My son struggles with these stupid things. He received a F once but when my husband and I reviewed it, turns out the teacher (or whomever graded it) doesnt understand independent clauses. She is also apparently against the Oxford comma. I had to re-learn everything I learned in school once I got to college and law school! Fortunately, my son understands the fundamentals because his dad and I teach him (Dad is very intense about grammar and punctuation). I think they need to spend more time actually writing. How many elementary teachers know what an em-dash is…. So frustrated by this. It’s not just elementary teachers… I’ve taught English at the middle school, high school, and community college levels. Few have had any coursework in grammar, usage, and mechanics. Many do pick it up on the job and learn to help their students. But with the rigorous Common Core State Standards, all teachers will have to up their game. Literacy is a shared task among all grades and subject areas. Quick fixes such as D.O.L. simply do not work. I experience the problem of what to do for warm up or in the time at the beginning of school. After 45 minutes of breakfast or bus unloading supervision, I have to fill out attendance, lunch count (we get burnt by the cafeteria manager if it is not in by a certain time), count-receipt money for field trips – candy sales – carnival tickets, etc. Then it is restroom time. Just what can be done during this time to keep the kids settled and quiet? You have to remember that in most districts the schools are ran for the benefit of the administration. I have used DOL, math warm ups, and others.Now we are told not to use these programs. Teachers have too many administrative and supervisory duties. Because of budget cuts, teachers have even more non instructional duties. Is this the way it is in other countries ? One other problem with Common Core: it assumes that the schools have tons of manipulative materials for math. Last year the schools around here ran out of paper towels at mid year and had no more money to buy any. Parents were asked to send in towels or money. The people who come up with Common Core and other programs need to get out and spend some time in a real school classroom. I used DOL with Navajo Reservation mid-school and high school students. Many now write to this retired English and reading teacher stating they still use those skills. One writes for a judge! One became an editor for the astronomy department of a university in the greater Southwest. Many use the skills when helping their children and their grandchildren complete homework at the dining room table. Several are lawyers and wonder how their secretaries graduated from high school because of ineffective spelling and punctuation skills. Interesting article and comments. I agree with you! I would like to speak to if possible about DOL. Please send me an email when you have some time and I will respond. I have some questions about teaching oral language and about a resource/supplement I’ve developed that worked with my students. I would beg to differ. Take a look at the PAARC and SBAC tests and the the test samples therein. DOL does not teach the deep language necessary to thrive on these high stakes tests. I think it is wonderful to hear all of these different perspectives, but it is our students’ needs that decide this debate. By reading their writing, we learn and assess their needs. Teaching mostly E.L.L. students (English Language Learners), my students need to learn how to edit. Period. It is also important to note that editing is different than revising, so I also write some of my D.O.L. activities to work on revision and structure as Mr. Pennington notes is important. My students appreciate D.O.L. and clear direct instruction of grammar to learn how to edit (fix or correct capitalization, punctuation, spelling, etc.). They appreciate grammar rules in context and models of what good writing looks like to learn how to revise (change–substitute, take out, add, rewrite or rearrange). I hope we are all teaching multiple stages of the writing process in a variety ways. Writing instruction is difficult! Good luck finding what works with your students. Wrote an article just for you (and thousands of other primary teachers asking the same question. Check out How to Teach Grammar to Primary Students. If teachers will use the DOL as a launching point instead of a stand-alone entity, it will work. I know. I use them daily. But I actually engage with the students. I guide them through the mistakes and explain why they are mistakes. We then talk and discuss what the corrections should be and why. You have to include the “why” or you are just wasting everyone’s time. DOLs were not developed to replace the teacher; they are a tool to be used. Too many teachers look for something that will do the job for them. Yes, DOL can serve as a band-aid, but why not “kill two birds with one stone” and teach grammar, usage, and mechanics well? It is so hard to “turn loose” those things we have alwyas done OR were done unto us. DOL is one of those things that I did, UNTIL I learned more about literacy instruction and best practices. Mark is right on. It does not work. Please read the research provided here and on other professional sites. Hey! I also used to do Round Robin reading and had them write their spelling words 5 times each and make sentences. Reading and Writing Workshop work so much better. Subscribe to the professional journals available with membership in ILA and NCTE. You will find out that Mark is right. DOL is a vital 7-minute part of my 7th grade period. I do not have the students correct the sentence; I put the corrections on the board in a different color and list them out so the kids are not guessing. Then I have my students write the DOL sentence correctly. They do not reinforce the mistakes. Sentence construction is transferred from the board onto their Google doc. Critical and analytical thinking is used to dissect the sentence and the whys and hows of grammar and mechanics are explained. This DOL becomes meaningful and sometimes humorous because I use A Sentence A Day (underlined because it is a title) by Samantha Prust. This little period of time gives a spelling, grammar, and mechanics learning boost. Based on what you have said, I am assuming we are discussing isolated sentences. Evan-More’s Daily Editing is certainly an improvement over the publisher’s Daily Language Review or the more popular Daily Oral Language (from many different publishers). The instructional scope and sequence of Daily Paragraph Editing is aligned to the Common Core State Standards and most other state Standards in grammar, usage, and mechanics. This being said, most of the same criticisms detailed in my article still apply. Editing in the context of a paragraph does not solve the issue of teaching skills in isolation. Requiring a student to write a similar article is not the same as requiring students to apply specific skills learned in a lesson in the context of their own writing. Additionally, Daily Paragraph Editing still only tests students’ previously acquired skills. Testing is not the same as teaching. Direct instruction in the language conventions of grammar, usage, mechanics, and spelling is what the Common Core Language Strand authors envisioned, not endless practice without effective instruction. Yes, kids need lots of practice, but we teachers need to remember what we learned in our teacher training programs about effective lesson design: Explicit Behavioral Objectives, Connection to Prior Learning and Lesson Transitions, Pre-teaching, Direct Instruction in the Content or Skill Standard with Multi-modality Examples and Language Support, Checking for Understanding, Guided Practice (which certainly could include some editing, but why not decision-making between what’s right and what’s wrong, instead of error-only scavenger hunts? ), Formative Assessment, Re-teaching, Individualized Instruction, and Independent Practice. Of course, teachers are accustomed to different names for the essentially the same lesson components. A cookie-cutter approach to instruction such as Daily Paragraph Editing, Daily Oral Language, and Daily Language Review winds up re-teaching what some students already know (a waste of time), not building upon previous grade-level instruction, and short-changing instruction for those students, such as our ELL, Special Education, and below grade level students who need assessment-based practice. Language instruction needs to be comprehensive and adapt to the assessment-based needs of individual students. Teaching that helps students actually learn and retain skills and concepts requires something more than just a writing opener used only a few minutes each day. We teachers can do better than piecemeal instruction. Bottom line? The Daily Paragraph Editing program is a short-cut to “teach” Language Strand Standards that can’t possibly transfer to long term content and skills acquisition. Teachers wind up “teaching” the same content and skills year after year, just as with Daily Oral Language or Daily Language Review. Clearly, we have better alternatives for effective instruction in the the Language Strand Standards. I used this approach several years ago, and found it a very effective way to reinforce good grammar habits. This was far from the only way that we taught grammar skills. This simply provided extra practice. One of the main reasons that it worked well is that practice was distributed over time, resulting in resilient habits and improved sentence construction. In second grade, I put 2 sentences on the board first thing in the morning. We corrected the sentences together. Then I erased the corrected versions, and replaced them with the uncorrected sentences. Students then wrote the corrected form of the sentences in a notebook, which I checked and corrected with students as work was completed (whenever possible). I required them to correct all errors. This encouraged a high level of accountability and encouraged them to really pay attention when we initially corrected the sentences together. I use DOL very successfully to teach grammar,editing, and peer-review skills.As a result, my students’ ELA sections have improved on multiple standardized tests. It is a good source to reinforce proper comma rules, semi-colon usage, subject-verb agreement, and parallelism. Students shouldn’t write the incorrect sentences. They record only the corrected sentences in their composition books. Ultimately, well-developed essay-writing skills and personal style are acquired only through writing, writing, and more writing. I remember doing DOL 20 years ago, and it really helped me become a stronger writer. All through college I got amazing grades on every essay I wrote, and never had grammar errors. Today I am the go-to proof-reader in my department, and I believe that DOL played a significant role in my success. I am pretty smart though, so I can’t speak for everyone. ???? I too have successfully used D.O.L. for years and the results for students have been their increased ability to recognize grammatical and mechanical errors in sentences. It goes without saying that the practices do have to be reinforced with instruction on the “why’s and how’s of grammar and mechanics. DOL worked for me, my generation, and generations before us. It wasn’t just error correction, the teacher would explain why the grammar had to be the way it was. Of course, the teacher is the key variable to any successful language instruction. I can’t resist the irony in your claim that “DOL worked for me.” Your last sentence has a comma splice and mixes verb tense.